The Cenozoic Era is the last and most recent of the geologic eras. Its name means “new life” coming from the Greek root kainos, meaning “new,” and zoic, “life.” While this new life came to refer to mammals-thus coined The Age of Mammals- this new life could have just as easily been the angiosperm or flowering plants, the insects, the newest fish (teleostei) or modern birds. All of these groups, including the mammals, continued to evolve during this present Era. During the Cenozoic, mammals evolved from their somewhat insignificant stature during the Mesozoic to include giant species that have gone extinct in modern times. While none of the mammals ever reached the size of the dinosaurs, there were some species that dwarfed their modern-day relatives. 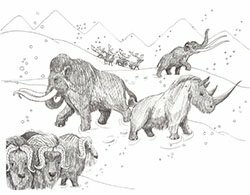 Everyone knows about mammoths, but during the Cenozoic Era some birds stood 7-feet tall. There were beavers 7 feet long! These creatures were typical of the growth achieved by the “new life” in the early Cenozoic. 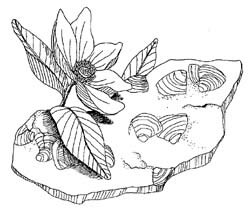 Flowering plants or angiosperms were became widespread in the Cenozoic Era. They moved into niches all over the globe. Trees, grasses, shrubs and everything in between, angiosperms came to dominate many of the earth's biomes. This was beneficial to insects, many of which evolved symbiotic relationships with flowering plants. The Cenozoic includes the period that began roughly 65 million years ago to the present. Historically, the Era has been divided into two periods: the Tertiary and the Quaternary. These terms came from the 19th century when rock formation in Europe was classified as primary (being the oldest), secondary and tertiary, with quaternary being coined slightly later. As more sophisticated geologic understanding evolved, primary and secondary were dropped from use. Only Tertiary and Quaternary remained as the divisions of the era. But these divisions don’t seem appropriate in the light of current understanding about the geologic changes that occurred during the Cenozoic. New terms are being used that relate more closely and accurately to the stratigraphy of the planet: Paleogene for the early part of the Cenozoic including the early two-thirds of the Tertiary Period, and Neogene for the last part of the Tertiary and the Quaternary. Suffice it to say, regardless of what it is called, the geology that occurred remains the same! But let us not forget that the Cenozoic Era is a geologic classification and get back to the geology that distinguishes this period. During this time, the continents continued the separation that had begun at the end of the Mesozoic Era during the Cretaceous Period. The Atlantic Rift was widening and forcing more continental separation, in particular Greenland from Europe. Other ocean spreading rifts caused the separation of Australia from Antarctica and Africa from India. The supercontinents of Gondwanaland and Laurasia that had been the result of tectonic movement during the Mesozoic, were now transforming into the continents of modern day. 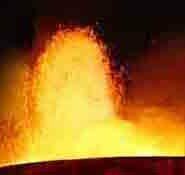 The rifts that occurred around the globe resulted in volcanic activity that formed mountain ranges. The Cascade Range that extends along the coast of North America from British Columbia to California is one example of this rifting/volcanic activity. Volcanic activity in Europe, Asia and Africa resulted in the formation of the Himalayan and Alpine mountain systems. And so the Cenozoic era continues. It is the era we live in, though we could hardly say this is the era of humans. We have been present as a species only about 1.5 million years of the 65 million years of the current era. That represents about 7 seconds on the clock of eras! From The Cenozoic Era to the big picture.